Only recently, in discussion with a friend, I learnt that the butterfly is referred to as Prajapati in Bengali. While the names such as Fulpakharu in Marathi, Titli in Hindi, and our own Pako were well-known to me, this reference in Bengali to the Hindu deity Prajapati ( the Lord of Creation) got me thinking. I presume it is the sheer beauty, the wonder of flight, and the transformation from the crawly caterpillar to a winged wonder that have evoked such admiration from everyone who encounters them. 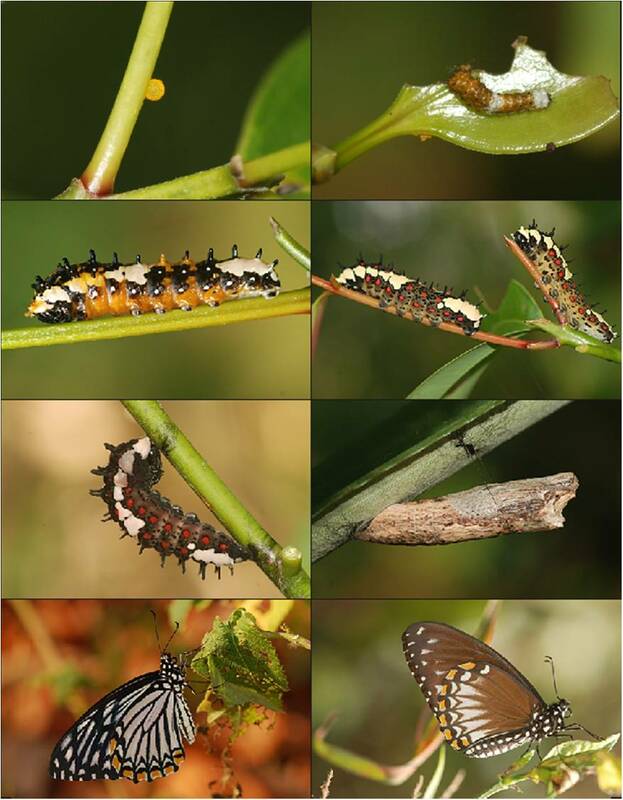 The makeover of a caterpillar into a pupa, and then a butterfly, is one of the most amazing transformations seen in the living world. The image depicts the life-cycle of the Common Mime (Papilio clytia) on its host plant, the Cinnamon Tree (Cinnamomum zeylanicum). The pupa which attaches itself to the stem of the plant appears like a dry twig broken at one end, and is an excellent example of camouflage. The adult butterfly exhibits two mimetic forms in both sexes. The dark form Clytia mimics the Common Indian Crow (Euploea core) while the striped form Dissimilis mimics the Blue Tiger (Tirumala limniace). This mimicry termed as the Batesian Mimicry has evolved wherein a palatable species mimics an unpalatable species thus sending warning signals to a predator to stay away. I am a post-graduate in Agriculture and Ecology & Environment. I am a recipient of the LEAD (Leadership for Environment & Development) Fellowship. I have compiled "A Catalogue on Birds of Goa" for the WWF-Goa Chapter and have authored " A Photographic Guide to Butterflies of Goa". My focus is on documenting the lesser-known fauna of the Western Ghats with special emphasis on Rhapalocera (butterflies) and Odonata (Dragonflies.